I purchased this product for a couple of reasons. The first is because of the good reputation of The Learning Company (I have several of their products) and "Schoolhouse Rock". Also, my child is completing 3rd grade this month. 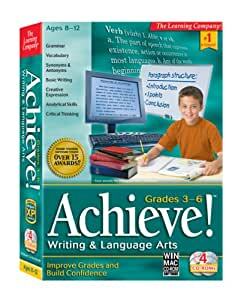 Software that reviewed third grade and went on into the next three years of school seemed perfect. Unfortunately, after I installed and started one of the four CDs, "Schoolhouse Rock", the program stated that it was for ages 6-10 (corresponding to grades 1-5). Another program, "Word Munchers Deluxe", also said it was for grades 1-5 after installing and running the program. This difference in age ranges is not stated anywhere in the discription or on the packaging of the software. The front of all of the CDs says "Ages 8-12", but this is not the case. These two programs look like my childs kindergarten and first grade level programs that he grew out of a couple of years ago. They focused on that level of computer experience as well. I would have been ok with grades 3-5 (ages 8-11) but the characters, graphics, and instructions were for a younger age group. It was too slow. "The Writing Trek" was very boring - maybe a good curriculum guide for elementary school teachers. The last program, "Strategy Challanges" wouldn't run at all, but I didn't care to find out why. I just uninstalled everything, and I hope to exchange it for something else. My child will not use these - they are not appropriate for his age. Another problem was found upon installing "The Writing Trek" CD - it says it is for ages 4-6. This must be an error. The goal behind this software is great. We bought this to give our computer savvy child some practice on writing and language art. The software is not of good quality. It has hard to use user interface. Especially compared to other educational software, this lacks the finish. My son soon got bored and has never used this. any 3-6th grade would not like it at all. The best thing in the game is the free cluefinders monkey adventure in my costco box. Most of the games look like they were designed for windows 95. I liked the clips from grammar rock, I remember these as a kid, but you could by the DVD of Schoolhouse rock and get better versions of those.